Definition at line 36 of file Libraries/mputil/DirectShow/MPDirectShow.cpp. References JIF, JIF_NRTN, m_curProject, m_height, m_recordMode, m_usingCompressor, m_width, pBuild, and pGraph. Definition at line 58 of file Libraries/mputil/DirectShow/MPDirectShow.cpp. References pBuild, pControl, pEvent, pGraph, and pWindow. Definition at line 662 of file Libraries/mputil/DirectShow/MPDirectShow.cpp. Definition at line 777 of file Libraries/mputil/DirectShow/MPDirectShow.cpp. References GetPin(), JIF, and pGraph. Definition at line 753 of file Libraries/mputil/DirectShow/MPDirectShow.cpp. Definition at line 333 of file Libraries/mputil/DirectShow/MPDirectShow.cpp. 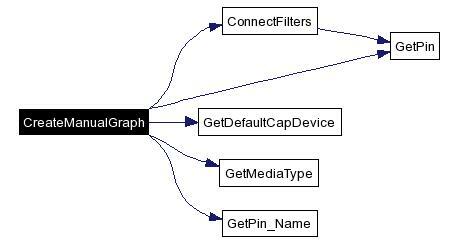 References ConnectFilters(), ds_blinkDetector, ds_colorTracker, ds_eyefinder, ds_mpisearch, ds_mpisearchAda, GetDefaultCapDevice(), GetMediaType(), GetPin(), GetPin_Name(), JIF, and pGraph. Definition at line 795 of file Libraries/mputil/DirectShow/MPDirectShow.cpp. Definition at line 812 of file Libraries/mputil/DirectShow/MPDirectShow.cpp. Definition at line 835 of file Libraries/mputil/DirectShow/MPDirectShow.cpp. Definition at line 80 of file Libraries/mputil/DirectShow/MPDirectShow.cpp. References i, JIF, JIF_NRTN, and m_deviceNames. Definition at line 141 of file Packages/win/VideoDemo/AppSrc/MPDirectShow.cpp. References JIF, JIF_NRTN, and m_ErrMsg. Definition at line 149 of file Libraries/mputil/DirectShow/MPDirectShow.cpp. Definition at line 218 of file Libraries/mputil/DirectShow/MPDirectShow.cpp. Definition at line 857 of file Libraries/mputil/DirectShow/MPDirectShow.cpp. Definition at line 701 of file Libraries/mputil/DirectShow/MPDirectShow.cpp. Referenced by ConnectFilters(), CreateManualGraph(), and DisonnectFilters(). Definition at line 725 of file Libraries/mputil/DirectShow/MPDirectShow.cpp. Definition at line 919 of file Libraries/mputil/DirectShow/MPDirectShow.cpp. Definition at line 559 of file Libraries/mputil/DirectShow/MPDirectShow.cpp. References JIF, m_recordMode, and pControl. Definition at line 304 of file Libraries/mputil/DirectShow/MPDirectShow.cpp. References CreateManualGraph(), JIF, pControl, pEvent, pWindow, and SetDisplayWnd(). Referenced by CVideoDemoApp::InitInstance(), and InitInstance(). Definition at line 574 of file Libraries/mputil/DirectShow/MPDirectShow.cpp. Definition at line 877 of file Libraries/mputil/DirectShow/MPDirectShow.cpp. Definition at line 591 of file Libraries/mputil/DirectShow/MPDirectShow.cpp. Definition at line 491 of file Libraries/mputil/DirectShow/MPDirectShow.cpp. Definition at line 73 of file Libraries/mputil/DirectShow/MPDirectShow.cpp. Referenced by InitInstance(), and Projectsbox::OnSelchangeCOMBOInputSize(). Definition at line 68 of file Libraries/mputil/DirectShow/MPDirectShow.cpp. Referenced by InitInstance(), and Projectsbox::OnSelchangeCOMBOProjects(). Definition at line 930 of file Libraries/mputil/DirectShow/MPDirectShow.cpp. References GetListedDevice(), JIF, m_deviceNames, and pGraph. Definition at line 520 of file Libraries/mputil/DirectShow/MPDirectShow.cpp. References JIF, m_recordMode, pControl, and pGraph. Definition at line 60 of file Packages/win/VideoDemo/AppSrc/MPDirectShow.h. Referenced by MPDirectShow(), and SetProject(). Definition at line 38 of file Packages/win/VideoDemo/AppSrc/MPDirectShow.h. Referenced by DeviceList::DoDataExchange(), FindAllDevices(), and SetVideoDevices(). Definition at line 39 of file Packages/win/VideoDemo/AppSrc/MPDirectShow.h. Referenced by DeviceList::DoModal(), and DeviceList::OnSelchangeCOMBOList(). Definition at line 61 of file Packages/win/VideoDemo/AppSrc/MPDirectShow.h. Definition at line 58 of file Packages/win/VideoDemo/AppSrc/MPDirectShow.h. Referenced by MPDirectShow(), and SetInput(). Definition at line 37 of file Packages/win/VideoDemo/AppSrc/MPDirectShow.h. Referenced by SaveVideo::DoDataExchange(), MPDirectShow(), PauseFilter(), RunFilter(), and StopCapture(). Definition at line 59 of file Packages/win/VideoDemo/AppSrc/MPDirectShow.h. Definition at line 57 of file Packages/win/VideoDemo/AppSrc/MPDirectShow.h. Definition at line 63 of file Packages/win/VideoDemo/AppSrc/MPDirectShow.h. Definition at line 60 of file Libraries/mputil/DirectShow/MPDirectShow.h. Referenced by MPDirectShow(), and ~MPDirectShow(). Definition at line 64 of file Packages/win/VideoDemo/AppSrc/MPDirectShow.h. Definition at line 65 of file Packages/win/VideoDemo/AppSrc/MPDirectShow.h. Definition at line 62 of file Libraries/mputil/DirectShow/MPDirectShow.h. Referenced by ChangeMPFilter(), PauseFilter(), RunDirectShow(), RunFilter(), StopCapture(), and ~MPDirectShow(). Definition at line 67 of file Packages/win/VideoDemo/AppSrc/MPDirectShow.h. Definition at line 64 of file Libraries/mputil/DirectShow/MPDirectShow.h. Referenced by RunDirectShow(), and ~MPDirectShow(). Definition at line 62 of file Packages/win/VideoDemo/AppSrc/MPDirectShow.h. Definition at line 59 of file Libraries/mputil/DirectShow/MPDirectShow.h. Referenced by ChangeMPFilter(), ConnectFilters(), CreateManualGraph(), DisonnectFilters(), EnumFilters(), MPDirectShow(), SetVideoDevices(), StopCapture(), and ~MPDirectShow(). Definition at line 66 of file Packages/win/VideoDemo/AppSrc/MPDirectShow.h. Definition at line 63 of file Libraries/mputil/DirectShow/MPDirectShow.h. Referenced by RunDirectShow(), SetDisplayWnd(), and ~MPDirectShow().